We have a complete range of Sublimation Printers made in Japan. This type of dye sublimation transfer printers is applied to produce supreme quality graphics for the purpose to target the production process of banners, flags, soft signage, interior decoration, curtain, bed linen, sportswear etc. The offered product delivers print types that can be applied to shift in objects like mugs, cups, mouse pads, snowboards and other objects. Customers can avail sublimation printers in various sizes ranging from 42” - 100” with a wide array of product line such as Mutoh RJ 900X1 Printer, 1300X1 Printer.VJ 1604W,VJ 1618W1,VJ 1628TD,VJ 2628TD Dye Sublimation. 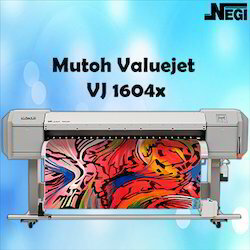 NEGI is exclusive distributor of MUTOH in India since last 19 years and successfully installed 3000 plus printers all across India. The compact ValueJet 1604W printer (1625 mm) is ideal for every day sublimation printing. The printer is t for both start-up and established businesses wanting to extend their product portfolio. You don't need to be an expert to run the VJ-1604W printer, as it is very easy to operate and maintain. 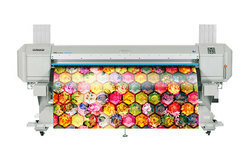 Competitively priced, VJ-1604W delivers consistent quality for volume production runs as well as short print runs. The VJ-1604W model features a variable drop print head with 8 rows of 180 nozzles, allowing output resolutions between 360 x 720 dpi and 1440 x 1440 dpi. Mutoh's ValueJet 1604W prints on typical 95 g/m - 100 g/m dye sublimation transfer papers, making the transfer on a wide range of flexible and rigid polyester materials possible. Using dye and pigmented inks, the ValueJet 1604W printer is also suited for the production of high-quality graphics for indoor and short term outdoor use - e.g. large-format reproductions of portrait photographs, the art reproductions, proofs of packaging designs, hard proofs of press print work, prints with very strict colour requirements. 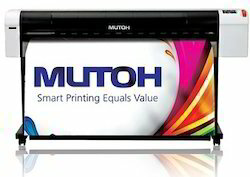 The compact Mutoh ValueJet 1624W printer is ideal for every day sublimation printing. The printer is fit for both startup and established businesses wanting to extend their product portfolio. 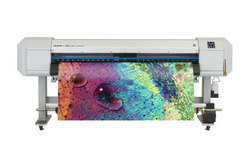 Mutoh ValueJet 1624W prints on typical 95 g/m - 100 g/m dye sublimation transfer papers, making a transfer onto all possible flexible and rigid polyester materials possible. Using dye and pigmented inks, the Mutoh ValueJet 1624W printer is also suited for the production of high quality graphics for indoor and short term outdoor use e.g. large format reproductions of portrait photographs, fine art reproductions, proofs of packaging designs, hard proofs of press print work, prints with very strict colour requirements. The MUTOH 1910 mm/75” Wide Professional Water-based Inkjet Printer is ideally suited for your daily printing needs The MUTOH VJ-1924WX, 1910mm wide single head water-based inkjet printer is ideal for everyday printing. 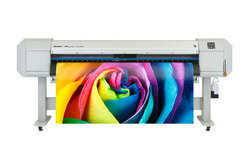 The VJ-1924WX delivers sellable production speeds up to 29m²/h at 360x720dpi. Its competitive price and outstanding performance make it easy to get into the world of soft signage. With easy to navigate controls and simple operation, the learning curve is short so you can focus on customers and profits. Create both dye-sublimation and direct printing to applications easily such as promotional items, custom apparel, banners, flags and much more! The MUTOH’s 1910 mm/75” Wide Water-based Inkjet Printer with staggered dual print heads is perfect for high-production dye-sublimation and direct printing to applications The Negi’ s MUTOH VJ-1938WX, high-speed water-based inkjet printer effortlessly delivers the best-in-class speed and superior print quality at sellable production of 52m²/h*. Creates scarves, blankets, promotional items, trade show graphics, flags, banners, custom interior designs, apparel, sports uniforms and more. The VJ-1938WX provides outstanding performance at a competitive price, making it the smart printer choice for shops looking to expand applications, increase production and improve efficiency. In today’s competitive market place you need a printer that is simple to learn and easy to run. The VJ-1938WX provides a low maintenance learning curve with no complicated operating issues. New 1910 mm/75” Wide Water-based Inkjet Printer with 4 staggered print heads opens a new era of high production dye-sublimation printing The MUTOH VJ-1948WX, newly developed high speed dye-sublimation inkjet printer effortlessly delivers the best-in-class speed and superior print quality. Staggered 4 print head-setup enables high-speed printing and improved productivity, the VJ-1948WX achieves a maximum print speed of 117.3m²/h*. With the addition of new custom modes, the options of the printing function are significantly widened. The large dual heaters are incorporated on the rear side of the front paper guides, and it provides fast dry times and accelerates production speeds. A special feature of the ValueJet Status Monitor (VSM), the ValueJet Print Server (VPS) provides high-speed and stable printing. NEGI is exclusive distributor of Mutoh, Japan since last 19 years and has successfully installed 3000 plus printers all across India. Setup for direct-to-fabric printing, the ValueJet 2628TD (2642 mm - 104.01") prints on non-stretch fabrics with open or closed structure (display fabric, flags, decoration textiles, ). Moreover, the ValueJet TD can also be used for sublimation printing onto transfer paper. The ValueJet 2628TD printer will open up a host of new business opportunities for users requiring a versatile floor-to-ceiling production oriented printer. The ValueJet 2628TD, with a maximum print width of 2622 mm (103.22"), is fully compatible with Mutoh direct disperse inks (for direct-to-fabric printing) and Mutoh dye sublimation inks (for transfer paper printing). 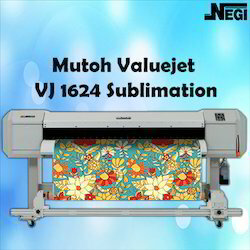 Negi range of Dye Sublimation Printers is available in various sizes from 42" to 100". Mutoh ValueJet Sublimation Printers will print directly on non-stretch polyester fabrics and are suited for the production of high quality company flags, country flags, beach flags, personalised advertising, textile gadgets, clothing as well as home decoration fabrics. Mutoh's ValueJet 2638 model will address the needs of PSPs and commercial printers looking for a high volume printing solution whilst requiring media compatibility with media rolls up to a width of 2.6 m.
The 4-colour high speed printer features a staggered dual head setup with latest generation 1440 nozzle 8 channel piezo heads, offering improved productivity. Using NegiPZO sublimation inks or Kiian sublimation inks , the VJ-2638 prints on heat transfer paper or by attaching fabric printing accessory allows to print on coated polyester fabrics. 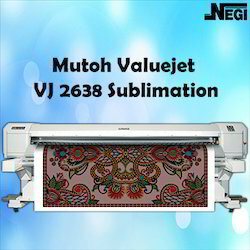 NEGI is exclusive distributors of Mutoh since last 19yrs and has successfully installed 3000 plus printers all across India. Specifically designed for architectural, engineering, construction, mechanical design and GIS applications, the RJ-900Xcan help you put your best foot forward. Offering a maximum media width of 24", the RJ-900X give you high-quality professional printers at an exceptional price point.